From the Shadowlands in the south to the Burning Sands in the north, from the Twilight Mountains in the west to the Islands of Spice and Silk in the east, Rokugan, the Emerald Empire, has stood for over one thousand years thanks to the seven Great Clans who serve the Emperor. As guardians and politicians, each clan fulfills their role in society and are as varied as they are powerful. But all are bound by the same code of honor, the way of the warrior, the code of Bushidō. Honor is valued above all else, and a misspoken remark can be just as fatal as an enemy’s blade. It is in this context that the clans battle. From the ancient rivalry of the Crane and Lion to the Crab’s daily skirmishes with the Shadowland forces always threatening to extend their reach into Rokugan, the clash of swords and pull of politics is a daily occurrence. But while conflict between the clans has dominated Rokugan for over one thousand years, the true threats await in the dark, known only to a few. The five elements of Air, Earth, Fire, Water, and Void are in a precarious balance, and the land of Rokugan teeters on the brink of chaos. 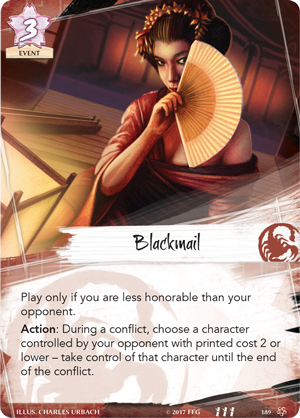 Are you a veteran of the L5R CCG? Click here for information on key differences between the LCG and CCG! 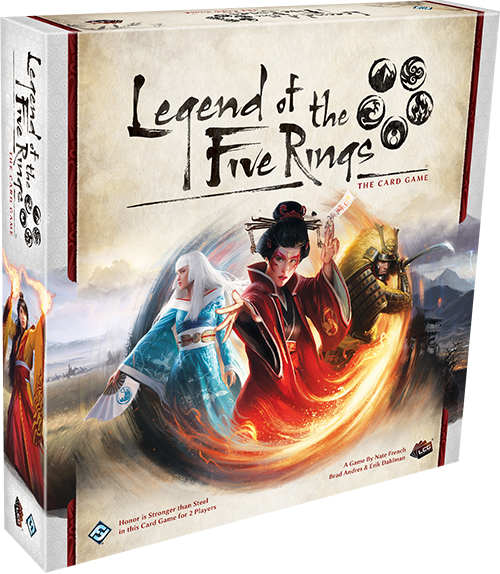 Fantasy Flight Games is proud to announce the upcoming release of the Legend of the Five Rings: The Card Game Core Set. 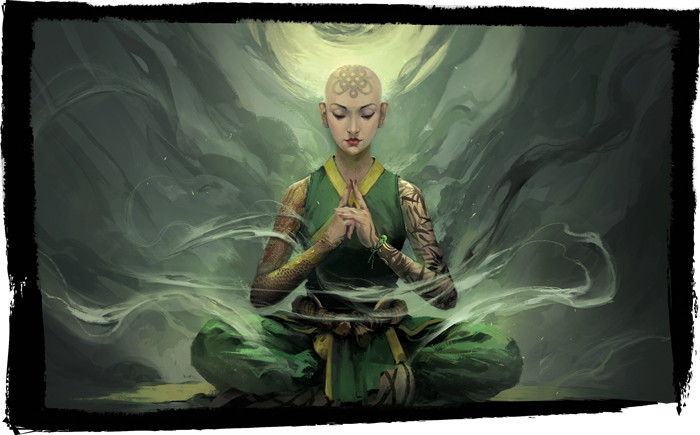 Originally released in 1995 as a collectible card game, Legend of the Five Rings has since thrived with its unique setting, engaging gameplay, and enthusiastic player base. 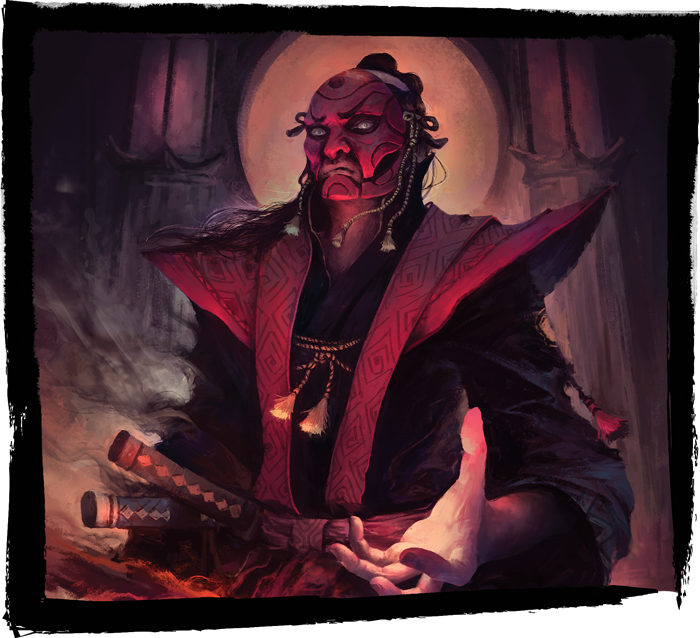 Now players new and old alike can experience Rokugan like never before in the Living Card Game® format. 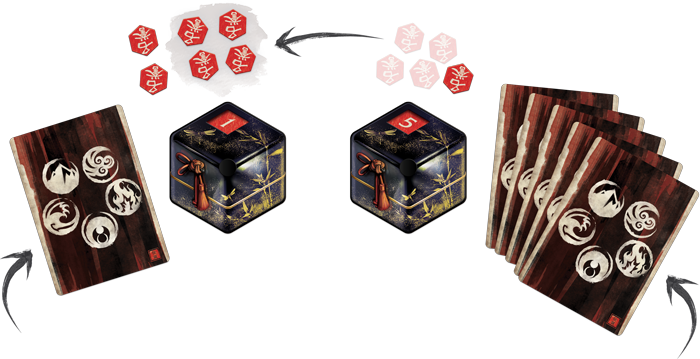 Important Note: Three copies of the Legend of the Five Rings: The Card Game Core Set are needed to have a complete playset of cards. 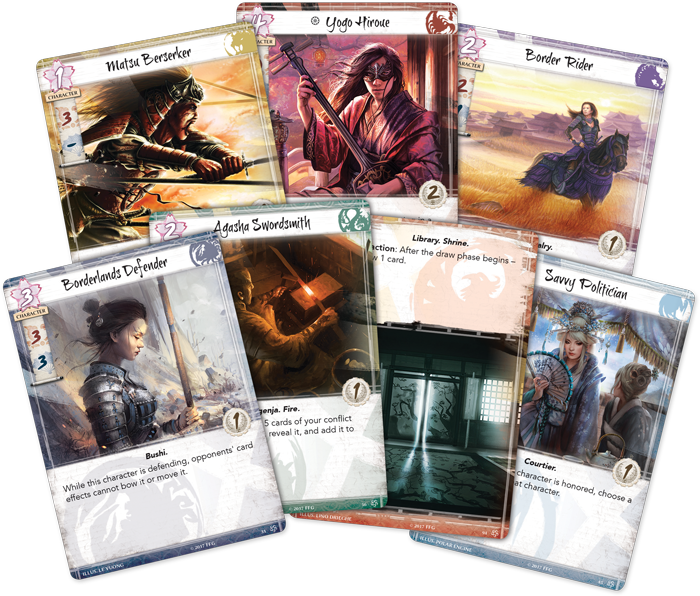 A game of Legend of the Five Rings: The Card Game begins with players laying out five provinces and populating four of them with cards from your Dynasty Deck, while the fifth holds your clan’s stronghold. Players then take turns sending clan members to their home area to participate in conflicts by paying for them with fate tokens. A typical set up for a game of Legend of the Five Rings: The Card Game involves four provinces between a Dynasty and Conflict Deck, a province and stronghold above the Dynasty Deck, and a home area for characters. Fate is not just the currency used to recruit characters to your battlefield, but fate also determines how long your characters will remain in your service. In Rokugani culture, there is a concept known as mono no aware which translates loosely to “the pathos of all things.” It is an understanding that nothing lasts forever, that there is an impermanence to everything in life. All things must pass, and just as the great warriors of Rokugan will fall in glorious combat or ascend into legend, new allies will come to take their place. When you pay for a character, you may place any additional amount of fate on it from your supply. At the end of a game round, characters with no fate on them are discarded. Then, you remove one fate from every character on the battlefield. Every turn then sees your warriors time running out; as the number of remaining conflicts both on the battlefield and in the courts begins to diminish, will they have enough time to achieve victory for their clan? 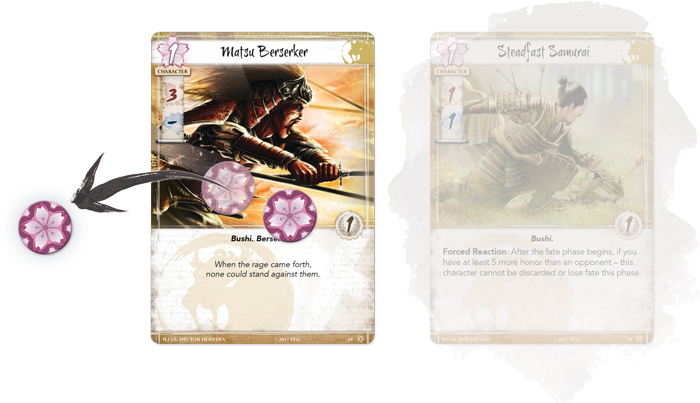 During the Fate Phase at the end of a turn, the fateless Steadfast Samurai is removed from the field while the Matsu Berserker loses one of his two fate tokens. The battlefields and courts of Rokugan are certainly a deadly place, but not one devoid of honor. As the seven Great Clans battle for power, they must take care to abide by Rokugan society’s customs, lest they forfeit their conquests in disgrace. After playing cards from their dynasty decks, players begin the draw phase, drawing cards from their Conflict Deck to supplement their tricks and battlefield maneuvers. The number of cards they draw is not static, and depends entirely upon how much of their precious honor they might bid. 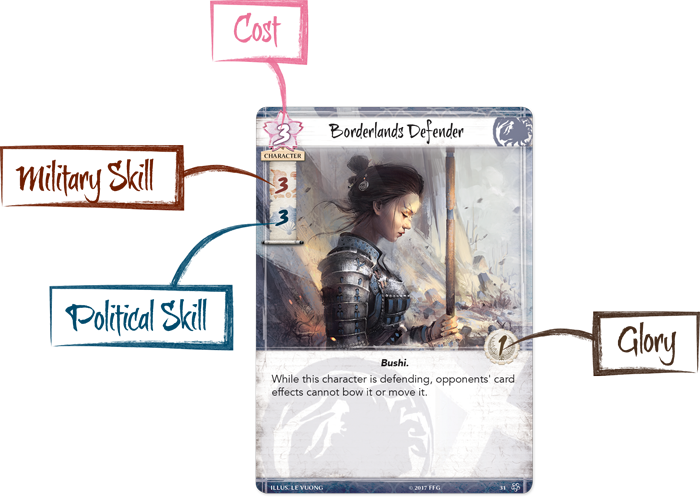 Players will use a unique honor dial to specify how many cards they want to draw (between one and five) from the conflict deck during the draw phase in secret. Players then reveal their dials to each other, with the player who bid more honor paying the difference to their opponent before both players draw an amount of cards equal to their honor bid. For example, John, playing the Dragon Clan, decides to bid five honor during the draw phase and Jenny, a Crab Clan player, decides to bid one. John would pay four honor to Jenny before he draws five conflict cards and Jenny draws one. 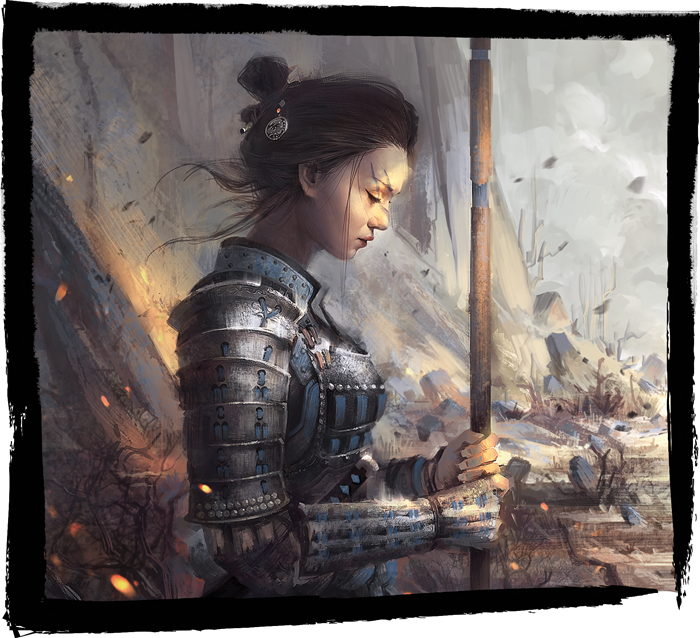 Drawing five cards every turn will see your clan’s honor quickly disintegrate, but compromises must be made to ensure you have enough tricks to get the edge over your opponent—finding this balance will be key to victory. The player on the left has bid one honor during the draw phase, while the player on the right has bid five. They both draw a number of cards equal to their bid, and the player on the right pays the player on the left four honor, the difference between their bids. Once both clans are properly prepared, the conflict phase begins, during which each player takes turns attacking their opponent’s provinces through military and political means. Players alternate declaring these conflicts on one another to both break a province and claim one of the five elemental rings of Rokugan, which allows the attacking clan to perform a powerful effect should they win that conflict. For example, the Air Ring effect allows you to take an honor from your opponent or two from the bank, while the Void Ring effect allows you to remove a fate counter from a character, pushing the ticking clock of their destiny. Players will send their strongest warriors and politicians to the battlefield, and then take turns revealing their surprises from their hand of conflict cards, whether it’s a powerful magical spell or last-second reinforcements. For example, a Dragon Clan player might want to declare a conflict against a Crane Clan player. 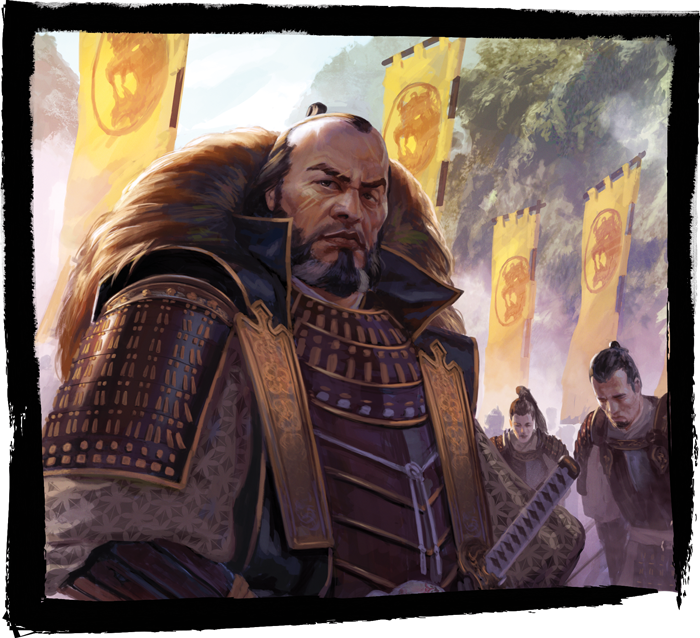 The Dragon Clan Player would first have to determine which of their recruited characters they want to send into the conflict, what kind of conflict to declare (military or political), which province to attack, and what type of element the conflict is. 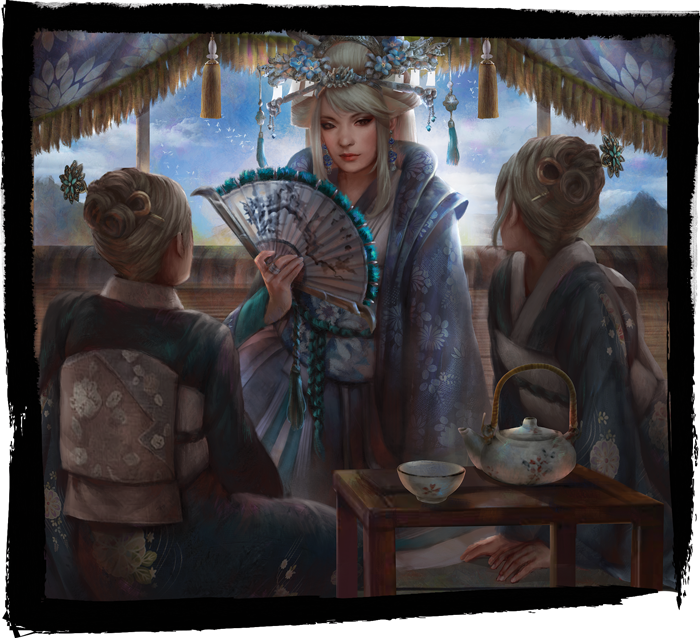 The Crane Clan player then picks which of their characters they would like to send to defend their province. A Dragon Clan player declares a military fire conflict at an unknown province, sending a Doomed Shugenja and Mirumoto Prodigy. The defending player now has an opportunity to send characters in their home area to defend in the conflict. Players then take turns playing conflict cards from their hand to give themselves an edge in the conflict. Every character has two skill values, military and political, that they add to a corresponding conflict. After all cards are played, the player with the higher total skill value that matches the conflict wins. Conflict cards can influence the skill values of participants in the conflict, add more characters to your side, or remove your opponent’s characters completely. Just because a player has the higher skill value at the start of a conflict doesn’t mean they still will after their opponent has unleashed their hand of tricks and maneuvers. If an attacker wins the conflict, they get to use the elemental ring ability of the element they declared. Furthermore, if their total skill value, less the defenders' total skill value, is equal to or higher than the strength value of the province they are attacking, the province becomes broken, bringing the attacker one step closer to victory. When a conflict is over, all participating characters bow and return to their home area. After all conflicts have resolved, one of the players will receive the Imperial Favor, a powerful force that we will explore in future gameplay previews. 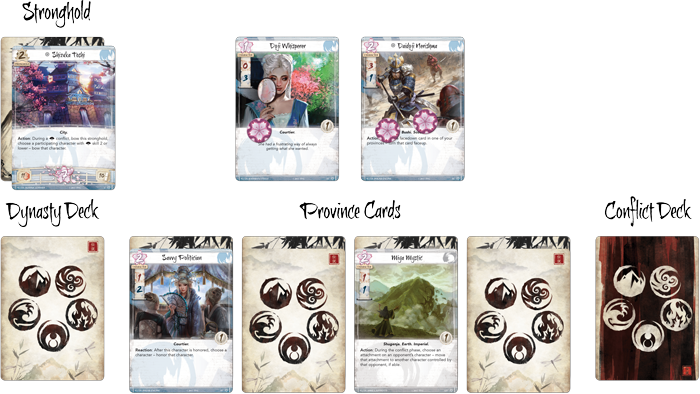 Clan provinces are filled with new warriors and holdings from the Dynasty Deck, and characters already on the field of battle feel the pull of time. Those with no fate left leave the battlefield, their time in the story at a close, for now. Those who remain have a fate token removed, one step closer to their destiny. Every character has a Fate cost, military skill, political skill, and glory value. We will explore each of these in depth in later gameplay previews. 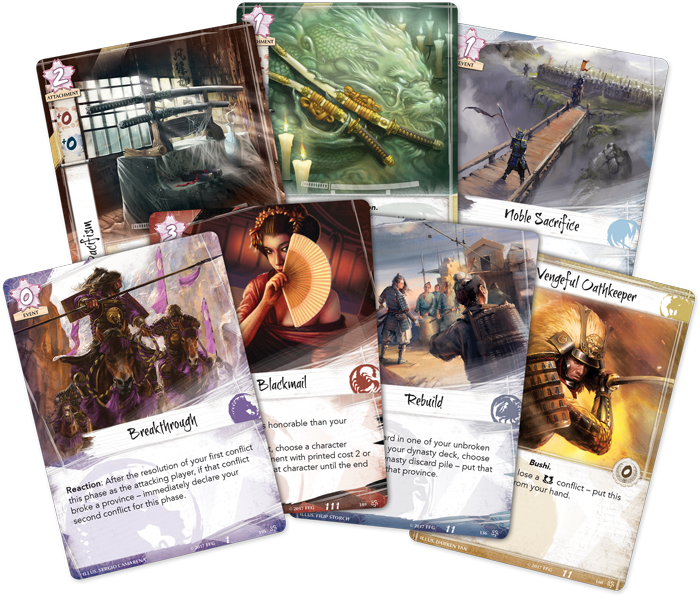 Legend of the Five Rings: The Card Game offers three paths to victory. First, you may break your opponent’s stronghold. If you successfully attack and break three of your opponent’s provinces via any combination of military or political conflicts, you are then allowed to attack your opponent’s stronghold directly. If that becomes broken, you win the game! Alternatively, if you ever accrue 25 honor, you have proven yourself the more honorable clan in conflict and immediately win the game. Conversely, if you ever lose all your honor, your clan has abandoned the tenets of Bushidō and you immediately lose the game. 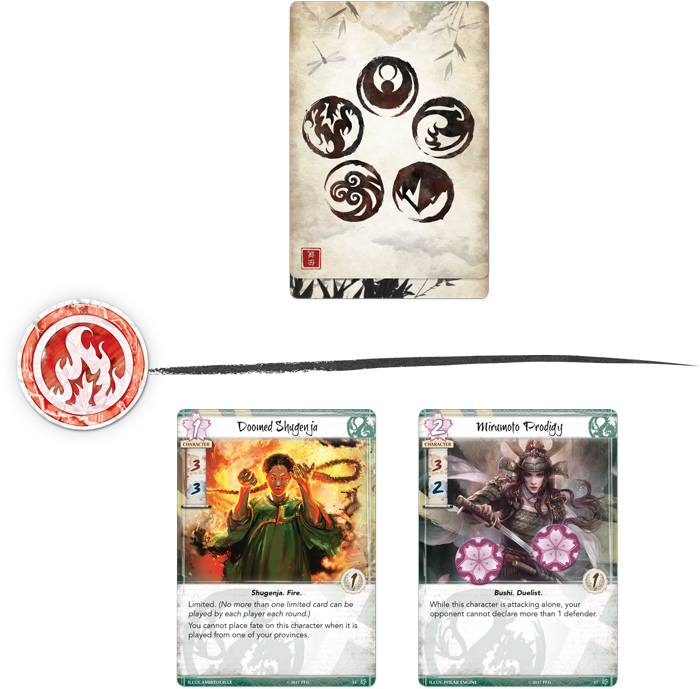 For over one thousand years, the Seven Great Clans of Rokugan have served the Chrysanthemum Throne according to their unique strengths and weaknesses. 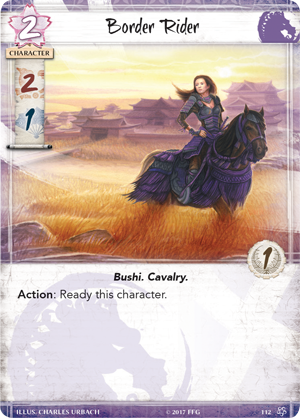 As conflicts break out across Rokugan, it will be these strengths that provide unique ways to play Legend of the Five Rings: The Card Game. Your clan choice will not only give you a unique way to play the game, but a way to connect with the land of Rokugan as you rally around your clan. 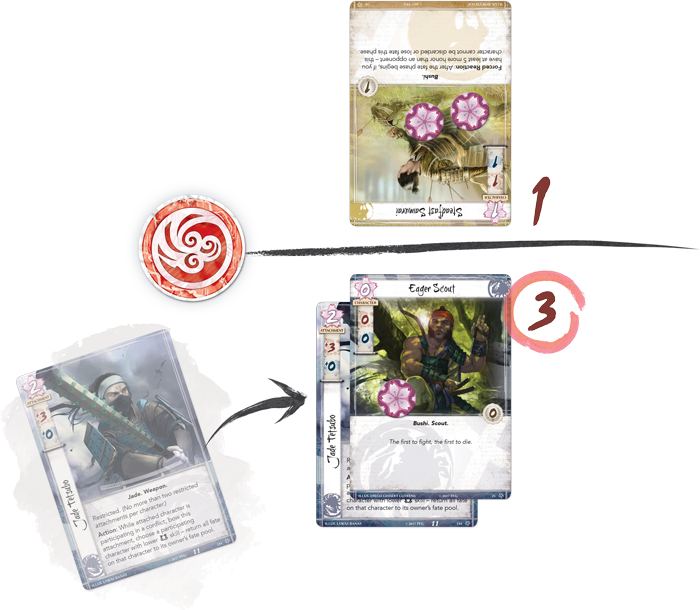 Each clan exemplifies a core tenet of Bushidō, and finding the clan whose philosophy speaks to you will be an important decision when deckbuilding. Players have the choice of becoming entrenched with the pure military might of the Lion Clan or the underhanded tricks of the Scorpion Clan. 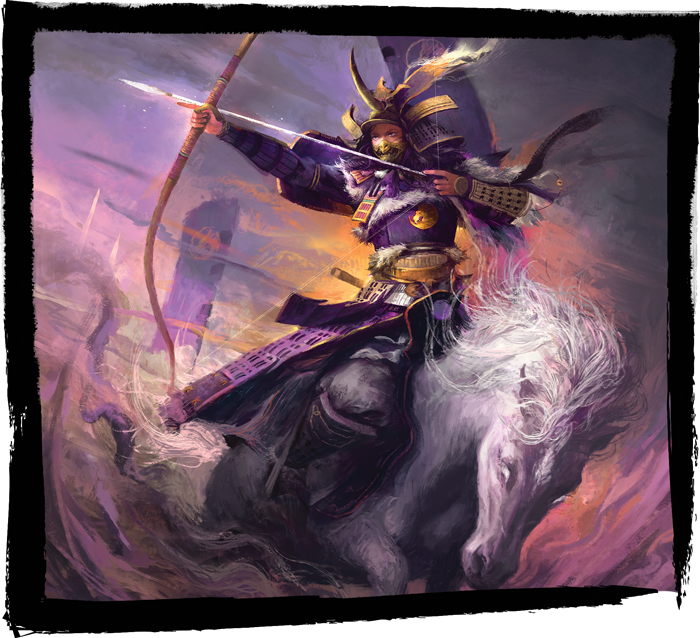 To become the pinnacle of honor and culture with the Crane Clan or learn the foreign ways of the Unicorn. From choosing between the arcane art of the Phoenix, the mysterious beliefs of the Dragons, or the stalwart self-sacrifice of the Crab. Regardless of their choice, no clan can avoid conflict, and all will be swept up in the struggles of the Legend of the Five Rings. 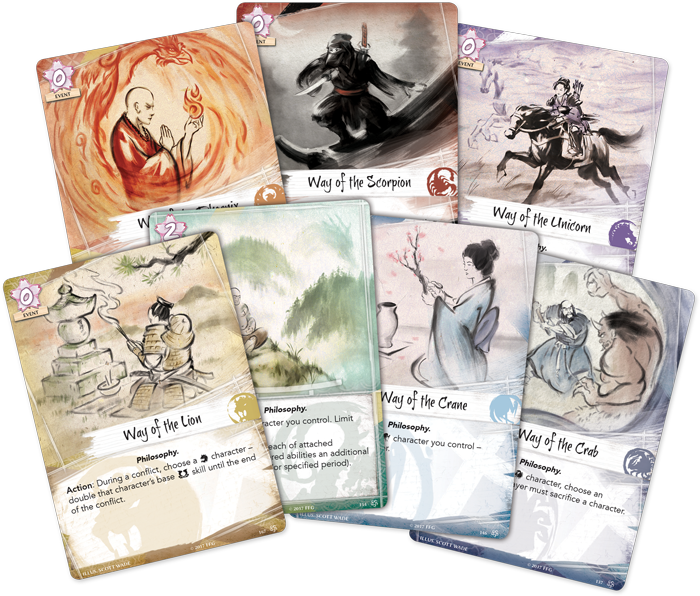 The Legend of the Five Rings: The Card Game Core Set features seven traditional watercolor “philosophy” cards, exemplifying each clan’s unique culture. 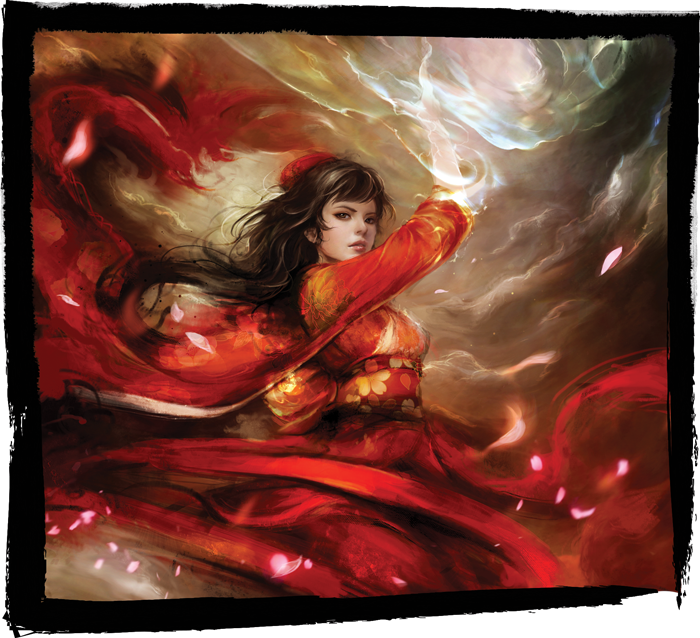 From this starting point, the storyline of Legend of the Five Rings: The Card Game begins! Look for the story to continue through fiction inserts in the Living Card Game, articles posted on our website, at select major tournaments and more.